The Department of Health (DoH) estimates that around 1% of the estimated 100 million Filipinos have chronic hepatitis C. However, not many Pinoys are knowledgeable about this disease. The fact is there is lack of awareness about hepatitis C and its transmission, prevention, screening, and management among patients, public, and healthcare providers in our country. To address this concern, Mylan, one of the world’s leading global pharmaceutical companies, in partnership with Hepatology Society of the Philippines (HSP) recently launched an awareness campaign for Hepatitis C in the country. The BEATHepC (Become educated, aware, tested and treated) campaign aims to spread awareness about the disease by disseminating information through pamphlets and promoting screening among Filipinos at risk. Present at the event was Hep C survivor and avocate Michael de Mesa. Hepatitis C is liver disease caused by the Hep C virus. Hep C is transmitted when blood from an infected person enters the body of another who is not infected. The disease progresses slowly, over the course of 10 to 40 years. It attacks and damages the liver, killing liver cells in the process. As a result, scar tissue forms, a process called fibrosis. For about 10 to 20 percent of people infected, Hep C can eventually lead to scarring of the liver (cirrhosis). Although some people will experience symptoms, about 80 percent of people with acute Hep C do not have any symptoms. 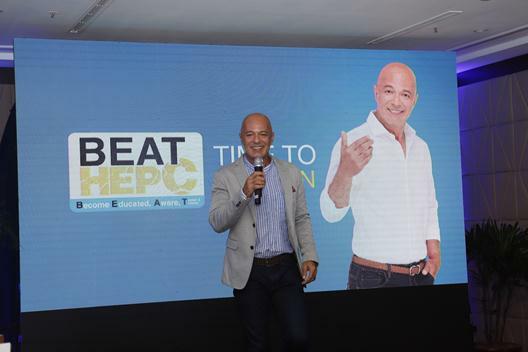 Mylan’s BEATHepC campaign supports the mission of the National Viral Hepatitis Task Force (NVHTF) to eliminate or significantly decrease the prevalence of hepatitis B and hepatitis C in the Philippines. This entry was posted in BEATHepC, Hepatitis, Hepatitis C, Hepatology Society of the Philippines, HSP, Michael de Mesa, Mylan, Mylan Philippines, Press Release. Bookmark the permalink.